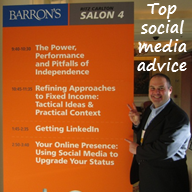 As the only speaker to have two speaking slots, Mike was able to give online marketing advice covering a wide range of topics. He highlighted online marketing trends and detailed how social networks can create both stronger client relationships and new business. Watch a few minutes of Mike’s presentations in the following 12 short videos. Prospects searching via LinkedIn (1:44) — learn why the traditional referral model has changed and why LinkedIn is an essential part of what prospects will search online before reaching out for more information. Traditional networking vs. LinkedIn (1:39) — understand why traditional networking is not as powerful as LinkedIn by comparing access to second-degree connections. LinkedIn profile advice (1:51) — know why to avoid jargon. Have your LinkedIn profile be well written and scanable. Also, keep it up to date to stay top of mind. 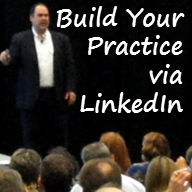 LinkedIn and the press (1:52) — recognize how LinkedIn can be used to get publicity. Business journalists use LinkedIn more than any other social network. Use the advanced search feature to find them and add the Publications section to share your press appearances. Also, list skills and expertise. LinkedIn Q&A (5:28) — see Mike answer questions about LinkedIn’s premium service, promoting a company page, un-connecting with people already in a network, connecting with ultra high net worth individuals and recruiting through the social network. Mobile’s impact on email marketing (3:29) — learn how mobile devices (smart phones and tablets) are booming. Discover how handheld devices are impacting other communication tactics like email marketing. Being the trusted option (2:04) — understand the importance of a strong webutation. What are your prospects going to find online? Will the professional and personal information online help build trust? Content marketing (2:37) — know why it is important to be flawseome (being awesome by having flaws). Laugh at yourself, make a connection with clients and become friends. Test different marketing content to see what works. Twitter advice (3:24) — identify the reasons to use Twitter, including both getting breaking news and getting the word out. 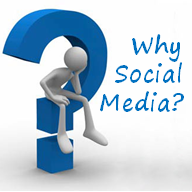 Social network stats (3:11) — learn some powerful social media statistics. Facebook dominates (based on usage and users), Pinterest is visual and very popular with women, and YouTube is the second largest search engine. 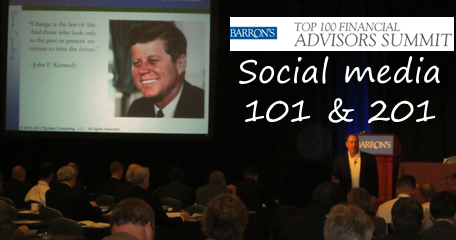 Client prospecting idea (0:58) — find out how social media trainings hosted by advisors can help educate the millionaires not using social networks (and even those that are). Clients will greatly appreciate it and prospects will too. 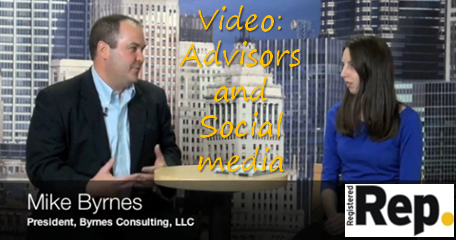 Social media Q&A (8:18) — see Mike answer questions about social media regulation, QR codes, Facebook personal versus company pages, and more. 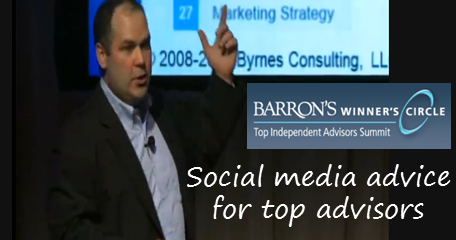 Need help with your online marketing strategy or interested in hiring Mike Byrnes to be a keynote speaker for your event? Contact Byrnes Consulting for more information.